Last week, mortgage rates continued to move upward, but at a slower pace than in the previous week. Existing Home Sales climbed another 2.0%, almost reaching a 10-year high, but sales very likely remain constrained by tight inventories. The minutes of the latest Federal Reserve Open Committee meeting revealed that the Fed may be even more likely to increase rates in December than previously thought. 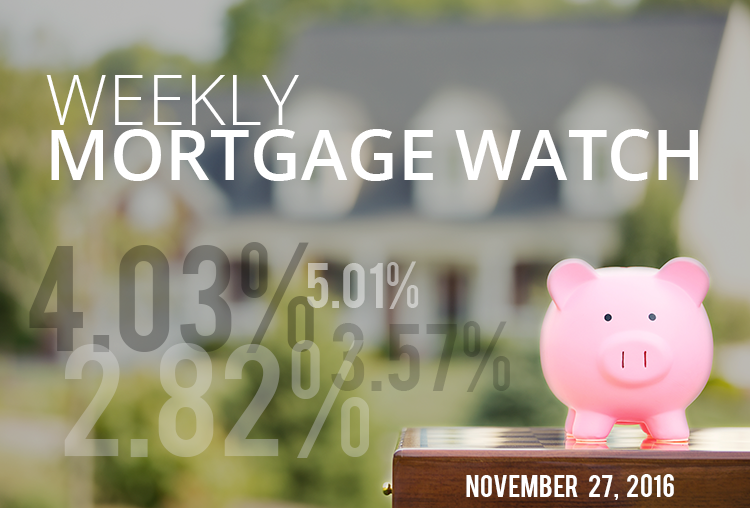 While the market may have mostly priced-in a December increase, the news does help set a higher floor for rates, should mortgage rates begin to trend downward in the coming weeks. This week is absolutely jam-packed with important economic data. GDP data is due, along with Consumer Confidence, the ISM Manufacturing Index, and the monthly employment report. Considering the current mood in the marketplace, every bit of strong economic data, especially any that exceeds expectations, has the potential to drive rates even higher. However, some of the increase we’ve seen recently could be tempered by investors cashing out gains, even as the market climbs. According to the latest research from the Census Bureau, the percentage of Americans moving has dropped to an all-time low of 11.2%. 42.2% of those who changed homes, moved for a “housing-related” reason, such as wanting a better home, while 27.4% of movers in the latest data moved for family-related reasons. Various housing sales data continues to trend upwards due to many factors including new household formation, international sales, and immigration.